China’s government has pegged its currency, the yuan (renminbi) to the USD for many years. Until mid-2005, the yuan was pegged at about 8.3 to the dollar. After numerous complaints that the yuan was being kept artificially low to boost Chinese exports to the U.S., the Chinese monetary authorities let the yuan appreciate from 8.3 to about 6.8 to the dollar in 2008. Due to the USD peg, the yuan has appreciated in lockstep with the U.S. dollar against other currencies. On the face of it, the yuan would need to devalue by 35% just to return to its pre-USD-strength level in 2011. This would imply an eventual return to the yuan’s old peg around 8.3–or perhaps as high as 8.7. The dynamic is clear. A splurge of new lending can help to dilute existing bad loans, but only at a cost. This is a game that can’t continue forever, particularly if credit is being foisted on to an already over-leveraged and slowing economy. At some point, the music will stop and there will have to be a reckoning. The longer China postpones that, the harder it will be. It seems the best way to assess the likely effects and outcomes is to look at what the Chinese government can control, and at what it can’t control. 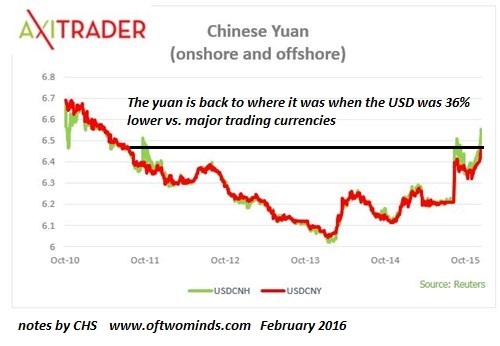 And we should observe at the start that the yuan is not a global reserve currency. Here’s the larger context of China’s debt/currency implosion. From roughly 1989 to 2014–25 years–the “sure bet” in the global economy was to invest in China by moving production to China. This is why “housewives” from China are buying homes in Vancouver B.C. for $3 million. That $3 million could fall to $2 million as the yuan devalues to the old peg around 8.3 to the USD. Who’s left who believes the easy money is to be made in China? Nobody. Anyone seeking high quality overseas production is moving factories to the U.S. for its appreciating dollar and cheap energy, or to Vietnam or other locales with low labor costs and depreciated currencies. For years, China bulls insisted China could crush the U.S. simply by selling a chunk of its $4 trillion foreign exchange reserves hoard of U.S. Treasuries. Now that China has dumped over $700 billion of its reserves in a matter of months, this assertion has been revealed as false: the demand for USD is strong enough to absorb all of China’s selling and still push the USD higher. 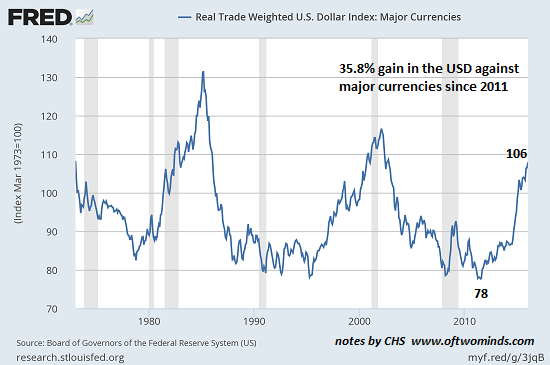 But that doesn’t mean the devaluation of the yuan has to stop at 8.3: just as the dollar’s recent strength is simply Stage One of a multi-stage liftoff, the yuan’s devaluation to 8 to the USD is only the first stage of a multi-year devaluation.